Wolf Maths, a project Chaos Created was commissioned to produce by TES iboard, has gone live. 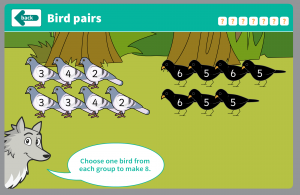 Wolf Maths is split into 5 topics covering Counting Forwards and Backwards Within 10, Comparing and Ordering Numbers Within 10, Addition Within 10, Subtraction Within 10, and Number Bonds to 10. Each Wolf Maths pack includes several interactive activities developed by Chaos Created, alongside printable games and activity sheets created by the TES iboard team. Wolf Maths provides an exciting, story-led approach to maths, providing a rich context for mastering essential skills within the national curriculum framework. Each topic is led by a short story about Wolf, a hopeless hunter. You can view the topics over on the Wolf Maths site. Activity packs can be purchased for £5.00 each, or accessed as part of a new TES Elements subscription.